Franchising in India: Today Indian franchise sector is growing at the rate of 38 per cent per annum with a present market size of US$ 7.2 billion and is expected to reach US$ 20 billion by 2013. There are 1200 active franchise concepts in India and over 110,000 franchisees. Education and retail are two important sectors where franchising is prominent. Fashion Franchising: The retail and franchise business models mature to gradually evolve into the best mode to tap the proven potential of Indian fashion retail. There are at present approximately 210 fashion franchise concepts in India, which includes both domestic as well as International. The nation presently has around 125 apparel, 10 lingerie, 35 jewellery, 30 footwear and 10 accessory franchise concepts. This number is bound to grow further as the industry is growing as annual rate of 12%. Most of the fashion franchisors are based in northern and western part of the country largely attributed to the manufacturing clusters present in these regions. The Report: The fashion & lifestyle Franchise Report is an outcome of a pioneering initiative taken by Franchise India Holdings Ltd. 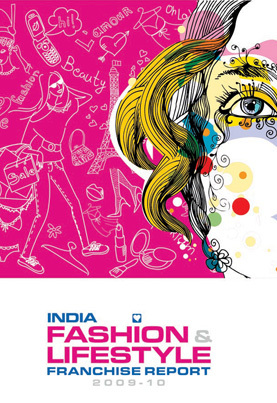 It accords the fashion franchising sector with the recognition it has long deserved. This report provides strategic approach to the opportunities and challenges being witnessed in fashion franchising. The primary objective of this report is to provide a snapshot of current trends in fashion franchising vis-a-vis expert analysis of various elements having implications on it. The Fashion & Lifestyle Franchising Report 2009 gives a comprehensive learning curve for fashion concept store owners and existing fashion entrepreneurs as well as companies to look out and replicate their brands success, through franchising across the country. Apparel Franchising: The 25 billion USD apparel retail industry, is one of the most franchised fashion concept. The report discussed the market size , segmentation , retail trends as well as the growth projections Report concludes that men's wear apparel segment observes the maximum franchise activity The kid's wear franchise activity presently at 25% is expected to increase in near future. Business format franchising is expected to increase in this segment. The report also discusses franchise model considerations as well as its various implications, including the minimum guarantee model which is slowly losing importance as the franchisors seek operational efficiency along with visibility and penetration. Jewellery Franchising: Diamond remains one of the most franchised concept led by Gitanjali and D'damas. This could be attributed to the fact that diamond retail being a new concept in early 90's, preferred to expand through franchising. Majority of the indigenous family jewelers based in Indore, Kolkota, Ludhiana and Delhi , realized the importance of branding by building significant brand equity and expanded through franchising. Western states seems to be leading this trend !